This has to be one of the greatest ideas ever brought to the table. Obviously, a terrific mom invented this idea. Breakfast is one of my favorite meals so; I get a little giddy when my kids ask for breakfast for dinner. I’m in. 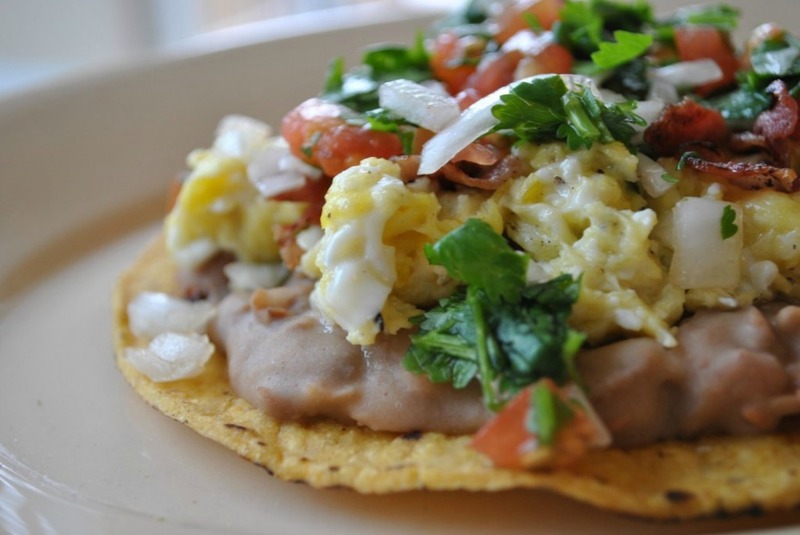 Breakfast tostadas are hearty, easy and adaptable to every taste bud. Spread a layer of refried beans over your tostada and top with the flavors of your choice. Pico de gallo is a must on my tostada for heat, while my girls love cheesy eggs. My nieces love chorizo and a bit of cilantro, while my nephew enjoys bacon and cheese. Serve buffet style and let each kid invent their own favorite flavor combo! Let them go crazy overboard with the toppings, but be warned the first bite is messy! I’m a proud Texan and blessed to be Hispanic. Currently, I am happily raising my two wonderful daughters, attending college and living life to the fullest with my handsome hubby in South, Texas. Food is a daily part of our lives, so why not celebrate our meals? Why not enjoy our time together in the kitchen, dine with family and friends all while learning how to create great meals. Here, at Sweet Life, we focus on our eternal love for Texas, but include our passion for introducing our daughters to their heritage. So on any given day, you can find Texas recipes or a wonderful recipe from Mexico. Do we love Tex-Mex? Oh yes, and we take pleasure in providing you great Tex-Mex fusion recipes also. This entry was posted in Recipes and tagged baking, Cooking fun, culture, Family, kids, parenting advice, recipe, Tween. Bookmark the permalink.